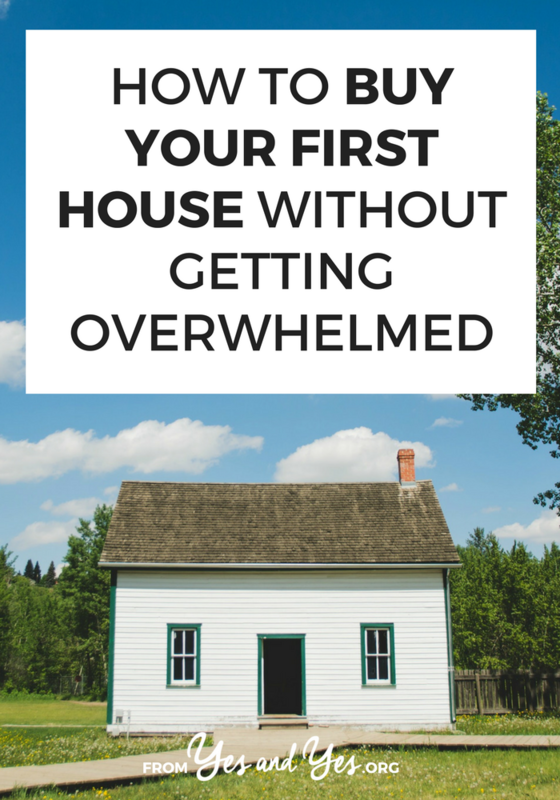 Are you try to figure out how to buy your first house? It can feel totally overwhelming! Mortgage rates and closing costs and inspectors, oh my! Thankfully, smarty pants and home-owner Liz Giorgi is here to help us out! We’ve all watched the home shows, which make buying a home look like choosing a pair of jeans: you try on a bunch and one will be “just the right fit” for you. The first question to seriously ask yourself is: why do I want to buy a house? At first, I really wanted to have complete control over my place. I felt I was old enough to make decisions about paint and shelves and art. My landlords were always nice, but every single one had their own quirks and working through them felt laborious to me.I also wanted to be able to control my living costs. My favorite apartment ever was located near the river in Minneapolis, but the rent went up by at least $100 every year. After a few years, it was getting unaffordable and unsustainable. These days, I know my monthly mortgage payment is always going to be the same. The second big question: how long do I want to live here? If you’re looking for a place to hunker down for the rest of your life, then you want to have your changing lifestyle in mind. The things you want and need in a place at 25 are probably going to be drastically different from what you need at 45. I’ve learned this lesson the hard way, because I currently live in a townhouse and while I loved not having to mow a lawn for the first four years, these days all I can think about is a hammock and a yard. Now, you need to start thinking about the money. Before taking the step of choosing a realtor and meeting with a finance expert, take a hard look at whether you are ready for the financial commitment of owning a home. When you own a home, you also own its problems. I still love the freedom of making choices about my home, but a lot of home ownership isn’t about choices – it’s “that’s broken and needs fixing.” A broken washing machine is my problem and there isn’t a landlord I can call to fix it. You can afford what you can afford. You don’t want to be house poor. You can save money to change paint, flooring and light fixtures in time. You don’t have to do it all right away. The housing crash taught a lot of Americans a really tough lesson, but it’s worth repeating: you shouldn’t buy a house to make money. Instead, buy it because you want something to call your own, to put a roof over your head and make a warm nest for yourself and the people you love. In the end, you’ll never regret having a place to watch movies with your favorite people. Start by making a list of MUST-HAVES that CAN’T BE CHANGED. What should be on this list? You can always buy new carpet or get stainless steel appliances – don’t put these items on the list. You can’t, however, magically create a larger backyard or move a house from one neighborhood to another – these items should be on the list. This list should guide your decision making.Be warned: It can be really easy to fall in love with a house 30 miles from your office because your money goes a lot further towards the kitchen of your dreams when you’re further from the city. Trouble is, you’ll be kicking yourself when you’re sitting in traffic five days a week completely unable to enjoy that kitchen. Trust me, follow your list! Next, make a list of deal-breakers. I won’t live in a really old, inefficient home. I can’t live in a home smaller than 1000 square feet. It would be impractical to have a home without a garage. Pretty simple, right? You wouldn’t think this would narrow down your search that much, but it really, really does. Now, you might be saying: “but stainless steel is a MUST HAVE and if a house doesn’t have it, it will be a deal breaker for me.” That’s fine, but if you are buying your first home and you live in a major metropolitan area, you WILL pay a premium for things like that. Oftentimes, that premium isn’t worth it. Now, start looking at houses! When walking through homes, I tried to think about how the life I live everyday would look in this place. I tried to imagine myself watching HBO in the basement and what it would be like to type up blog posts in the office. The more you can envision yourself in a place – the more likely you’ll start to love it. Eventually, it should come down to a combination of things: the home you choose should include your MUST HAVES – PLUS you should feel at least a little excited about living there. I found a townhouse that made the cut and I know I made the right choice, because I’m still excited to come home every day. Share your house-buying tips on the comments! I'm in the process of buying my first house now. It's both exciting and a bit overwhelming. After living in rented accommodation for so long I am a bit worried about not having someone I can ring up if something breaks! It's a bit early for me to be giving tips, but I think it really helps to see as many houses as you can, to help refine what you do and don't want. It's a good idea to set up a savings account to use for home repairs. I think the rule of thumb is to annually set aside 1% of your home's worth. E.g., for a $150,000 home, you'd save $1500 a year. Divided over 12 months (or 24 paychecks, depending on your set-up), that amount isn't too bad. And then when you do have to have your house painted or replace a major appliance, you're less likely to have to scramble for that money. Even if you can't make 1% fit into your budget, do try to set aside some percentage on a regular basis. My advice is that when you're looking at what you can afford, speak to a mortgage broker. They're free (they make their money through commission from the bank, so do keep that in mind when making your final decision) and they're really good at laying out all the costs including things like taxes, rates etc and will make you think about what you can really afford to repay. Also, I'm learning this the hard way but be prepared for the unexpected. My husband and I bought our house in March and a month ago, I lost my job. For a while there, we were looking at having to either sell or rent it out and live with our parents but luckily I've managed to find a casual job to pay the bills until I find something new and permanent. You can get income protection insurance if you think it may be a problem but it's also a reminder to prepare for the unexpected! However that stress is still worth not having rent inspections and being able to drill holes in the wall! Great advice about making changes over time. We bought my husband's grandparent's farmhouse. There was so much to change. Some easy – take the deer heads off the walls, some difficult – remodel second story and add a bathroom. We have slowly made it work for us, and I'm looking forward to more changes in the future. It doesn't have to happen all at once. We bought a home really early, and on two incomes, and we were extremely naive about the whole process. Not only that, but because we rushed it, we missed out on an amazing non-profit that works within our city (Lincoln, NE), Neighborworks, that actually gives out grants from $10K-25K per house based on the amount of work it needs, because they want to get homeowners in the more run-down parts of town. For 4-6 months of weekly classes on everything from finances, to how-to-fix-its, this class would have stopped us from making a poor decision (25% of take-home pay being the mortgage, not nearly 50), and we would have thought more about how long we were actually interested in staying in that house and if that was a good idea (2 years, not the 5 we had to own it). Lucky for us we had a rent-to-own agreement with a tenant for 2 1/2 years, and she was finally able to purchase in Feb. It worked out as it gave us some sort of income from the rent, all the fixing was hers to sort out (rent to owns do that), and she was highly motivated because she loved our house. It worked out in the end, but boy did we learn a LOT of lessons. Biggest one: don't make your mortgage (or rent) be more than roughly 25% of your take home pay. You will actually have room to breathe when something happens. Who knew drilling tree roots under your basement pipes would cost $500??? 🙂 It's better to lower your standard of living and have peace of mind, than in a fancy house that is causing you daily stress! I'm no where near buying a house, but these realistic tips are useful! I do not own a home.. but I want to really bad. -When in doubt, don't settle! This goes for everything- the house, your realtor, lender, insurance policy, etc. I just did a rather long, laborious project on home buying in different scenarios for my math class and I think the biggest thing to consider is the down payment. It can affect your monthly payment and the amount you pay long term so much! My sister-in-law just bought a house with a 3% down payment. Because of that she has a 30 year mortgage where the monthly payment is what a normal 15 year mortgage would be! If I'm going to be paying $1700 a month it'll be because I want to be mortgage free in 15 years. I've rented the same place for 3 years and I love my landlord and the freedom he affords my husband and I. Buying a house is in the distant future, but you can be sure we'll put at least 20% down. This is such great advice! We bought a mobile home around 4 years ago and learned a lot of these things the hard way. Like, for instance, just because it's called a "mobile home" doesn't mean it's conducive to a mobile lifestyle. Also, having to go without a refrigerator for 2 months because yours broke and you can't afford a new one right away SUUUUUUCKS. We ended up selling our house and going to back to renting and we LOVE LOVE LOVE it. We can move almost any time we want, we aren't responsible for things like broken major appliances and yard work, and if our income suddenly changed, we don't have to worry about a 30-year mortgage. MAYBE one day we'll buy a house again, but for right now, we love renting. Your very last bullet point brings up something that I feel unfortunately has gotten muddled in these discussions. What does it mean to "make money" on a home? On the one hand, owning a home is a vehicle for "forced savings". Every month you pay some money, but that money doesn't disappear like it would if you were paying a landlord; you get it back at the time of resale. The problem is that most people don't think this way. They want to buy a house for $300,000 and sell it for $350,000 and say they've "made" $50,000 in the process. So yes, don't buy a home to "make" money, but definitely buy a home to "save" money. And lastly thanks for your wonderful article…thank you! I'm hearing from some people that getting rental space is becoming far more popular these days, like a makati house for rent for most of our guys working overseas. The number one rule in house-owning these days is taking things slow and steady. Grabbing all the fixtures, upgrades and add-ons for a house in one fell swoop just isn't viable anymore. We really have to stick to "one sofa at a time" if we want to keep our houses.